The hostel, refurbished in 2012, is located within the former Winter Olympics athletes' village in the Lingotto area south of the city centre. 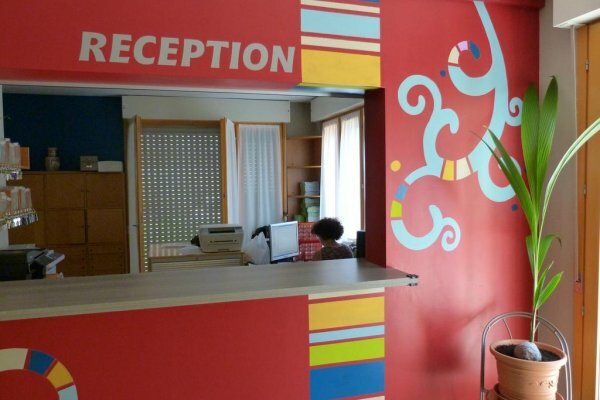 As well as easy access from Lingotto rail station (8 minute walk), the hostel is well served by underground, tram and bus services from the city centre and the rest of the city - see "Find us". The Conference, Festival and Commercial/Art Centre of Lingotto is reached directly by the Olympic footbridge, as is the Lingotto underground station, when travelling to and from the Politecnico, for example. The Olympic Stadium complex and PalaIsozaki are 20 minutes away, Hiroshima Mon Amour 5 minutes, and the "Faculta' di Economia e Commercio" 14 minutes, all on foot. 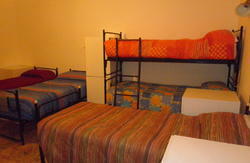 There are 95 single beds distributed in single, twin and 3-, 4- and 6-bedded rooms, most with en suite facilities. Single travellers, families and groups are all most welcome. Check in from 14.30 to 22.30. Check out from 7 am to 10 am. Laundry: there are token operated washing machines and dryers, and drying racks. As well as the tokens, you can also obtain an iron and ironing board at reception. Hairdryer: available to borrow at reception. Personal hygiene products: can be bought at reception. Free luggage storage: available on arrival and departure days only. Safe for small objects is located at reception: Most rooms also have securable lockers. Free access to Internet-connected desktops at the ground floor. Turin city street and bus maps and local bus tickets are available at reception. 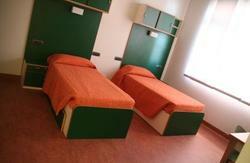 The hostel is located between Piazza Galimberti and Lingotto Rail Station. There are many direction signs to the hostel within a kilometre of the hostel reading "Ostello della gioventu'" in white lettering on a brown background. By car: From the "STUPINIGI" exit from "Tangenziale Sud E70/A55" take "Corso Unione Sovietica" towards the city centre. After 3 kms, at the cross roads with Corso Cosenza and Corso Giambone, continue on to the service road of C. Unione Sovietica (that is veering to your right). After 200m along the service road take the (4th) right turn into Via Asuncion and proceed to the end (alongside Piazza Galimberti) and to Via Giordano Bruno. 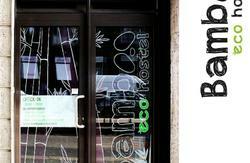 The hostel is accessed by turning right onto, and then immediately first left from, Via G. Bruno (follow hostel signs). By train: From LINGOTTO station, keep right from main exit and follow hostel signs. From PORTA NUOVA station, take tram No 4 (sometimes bus No 4) in the direction of "Strada del Drosso" and get off at the "San Marino" stop. Cross the tram tracks and the main road and follow the hostel signs. From PORTA SUSA station, buy a single ticket for the underground (M - "Metropolitana") and change at "Re Umberto" station on to bus No 14 ("Negarville") or bus No 63 ("Barile") and get off at the "Giambone" stop, using the same ticket. Walk back 50 metres and turn right following the hostel signs. By plane: From Caselle airport "Sandro Pertini" catch the bus SADEM to Porta Nuova rail station (see: www.sadem.it) and follow the instructions above. From MALPENSA airport, take SADEM bus to Porta Susa rail station and follow the instructions above.